You are at the beach! Swim, Snorkel, Surf or Just Relax at the Beach or Pool! Soak Up the Natural Beauty of Kauai! It is all just steps away! Your second floor, ocean view lanai is only 300 feet from the ocean in the sunny South Shore Poipu area of Kauai, 'the Garden Island.' You will be lulled to sleep by the ocean waves and the trade winds whispering through the palm trees in adjoining Prince Kuhio Park. The view from the bedroom is 180 degrees, ocean to mountain. The atmosphere here is 'Classic Hawaiian,' mellow and laid back. Two beaches are each a three minute walk and feature protected swimming and snorkeling with turtles and fish inside the reef, as well as surfing at PK's, Centers, and Acid Drops on the outer reef. Many more beaches and surf spots are nearby. 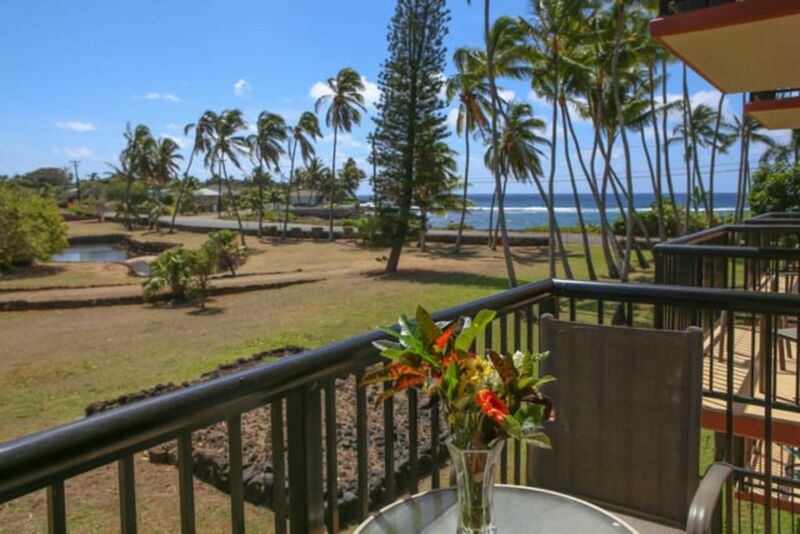 Close by are all Poipu and Koloa restaurants, golf courses, shopping, and services. Other South Shore Kauai attractions are a short drive away. Don't miss the Beach House Restaurant, across the street, famous for the magnificent sunset view. Value! This is one of the best-kept secrets for rental values in the Poipu area. Our beautifully appointed, one bedroom condominium unit has recently been totally refurnished with new furniture. It features a king bed in the ocean view bedroom, full kitchen, dining area, bathroom, washer/dryer, and a garden-view living room. Pets are NOT allowed, No Smoking. The grounds are lushly landscaped and feature a pool, barbecue area, and covered parking. Prince Kuhio is a small complex and is rated a 'solid gold value' by 'The Ultimate Kauai Guidebook'. Prince Kuhio is a 3-minute walk to fabulous snorkeling and surf-breaks.